Have a look around the site and learn how you can enjoy beef in your diet in a healthy and sustainable way. C'mon in and solve your omnivore's dilemma! Skipping Stone Farm raises and markets 100% grass-fed beef. We have been providing pasture-fed freezer beef directly to customers for over a decade. 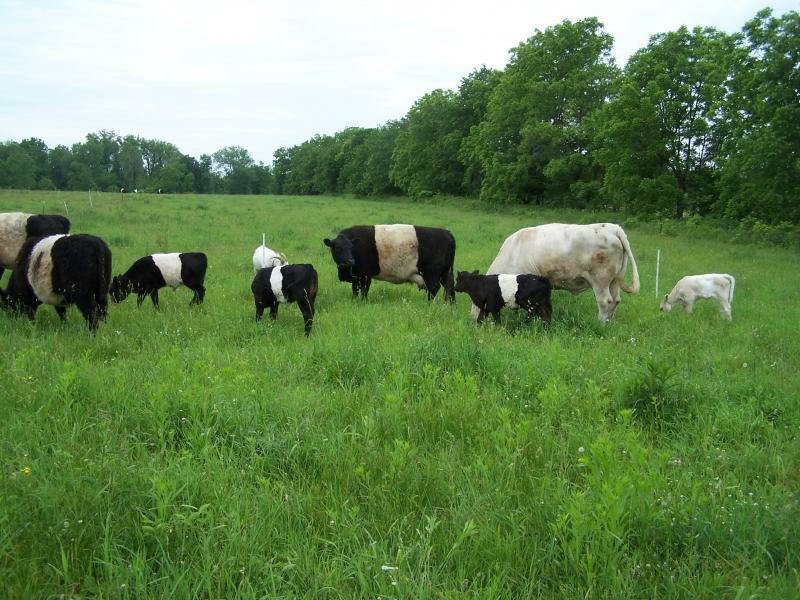 Our herd of Belted Galloway cross cattle has grown steadily over the years, nurtured by all-natural pasture, unprocessed minerals, and clean well water. Our cattle are born & raised the way bovines should be: Out on the grass, enjoying the freedom to stroll, graze, and enjoy the sunshine! We work with a processor who provides a long dry age time, for tender, tasty beef. Check out this NY Times article about why it's wise to avoid industrial ground beef: E.Coli Path Shows Flaws in Beef Inspection. You can reserve a split quarter, side, or whole beef; or purchase individual cuts directly from the farm.